Sorry for the delay! I meant to post this earlier in the day, but I have been out running errands, which took a bit longer than planned...Are we ready for our third, and final part to this CAL?? THIS is the part where all the scraps come in! Rnd 6: ch 1. Sc2tog, 8 times. Join (8 sts) Stuff this part now. Legs: *ch 6. Sl st in 2nd ch from hook, and each of the remaining 4 chs. Sl st in next st on body*. Repeat (*) 7 more times, for a total of 8 legs. Fasten off. Weave in ends. Make your Octos in lots of different colors, to teach young children their color wheels. Use Neons and Pastels, to teach differences. Make a desired number (say 10), and have the children count them as they remove them from the pool or return them to the pool. They can also count the legs of each Octo. You can even stitch numbers or letters on the Octo heads to teach number/letter recognition! Have them spell out their name? A fun and imaginative way for little children to learn the basics...the possibilities are endless! 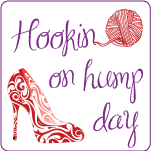 Are you ready to crochet along with me? I am so ready to have a little fun with everyone! I posted the Materials List for this project the other day. I will include it again here, though :) The beauty of this project is it's a GREAT stash buster! If you have little balls of leftover yarn from other projects, you can use them up on this one, so go grab the scrap bag, and let's get going! Rnd 8: ch 1, TURN. *Hdc in each of the next 6 sts. Work 2 hdc in next st*. Repeat (*) around. Join. (64 sts) If you are changing colors for the next section, fasten off, and join new color now. Otherwise, continue on. This is what you should have at the end of Part 1. Sign up for CBS Store eNewsletter & Save 15%! There are 2 major components to the pattern we will be using. One part is large-ish...the other part is small, but you will be making multiples of that part. So~dust off your scrap bag~it's PERFECT for this! *Worsted weight yarn~1 skein is more than enough for the larger part. That's it~This will be a great project for beginners, advanced crocheters, and anyone in between! Perfect for homeschoolers or educators, or anyone with young children to occupy, so make sure you invite your friends to join us~We'll be starting soon! I will have a fun, easy, and FREE new design coming soon. It will be posted here, in sections, so everyone can join in at their own pace. All it takes is some leftover yarn (this will be a GREAT stash buster!) and any size hook you desire. All sections should be easy to compete in an hour or less, too, so you won't have a huge investment in time. As we get closer to the actual event, I will post a suggested materials list~I hope you will all join in! !